“Kawaii!” cried grown people, too. 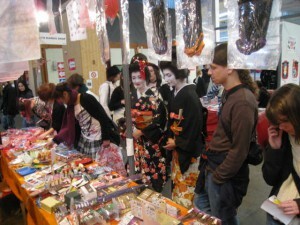 – “Japan Expo in Paris” organized by SEFA is an event of Japanese manga, animation and sub cultural goods gathered together in a site. Recently it shows remarkable growing. In the last September the event accepted 134,467 visitors, while three years ago the number of visitors was 41,000. 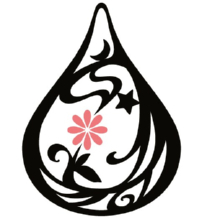 SEFA has held Chibi Japan Expo responding to the furor, besides the regular one in Paris. Makoto. Kurita, only participant from Japan, did flourishing business with socks and other goods with ornaments of characters. – He says “I want to market more Japan abroad.” in connection with his participation to the event this time. Last year he had chance to see the furor there. But at the time he was irritated at the fact, that most vendors of Japanese commodities were foreigners. In the article the phrase “Kurita, only participant from Japan” is not correct. It must be “Kurita, only direct participant from Japan”, because some Japanese residents in Marseille had booths besides me. But it is correct that many Chinese and Koreans were selling there under the name of Japan. What a waste of chance, overlooking such a fever! *(Photo) Two in kimono is French girls. Every day they visited there in this costume.